(1 each/unit) PPC's revolutionary AquaTight integrated port seal technology has now been expanded across the entire EX Series product line! This design concept combines an EX compression connector with an integrated port seal and guarantees the use of a port seal every time to eliminate moisture migration problems. The unique patented design of the EX body achieves true universality on 60% throughQuad Shield, PE, and PVC jacket for RG 11 series cable. 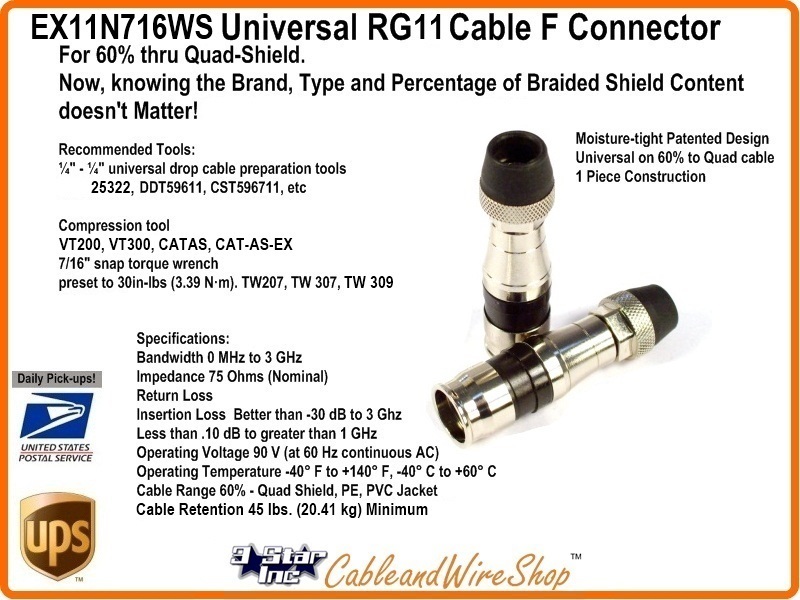 Economical for Use on All RG11 Coaxial Cables with 60%, Tri and Quad-Shield, passing 3 GHz. Now, knowing the Brand, Jacket Type and Percentage of Braided Shield Content doesn't Matter! One connector for 11 Series SCTE specification drop cables including 60% braid, Tri-shield and Quad shield. To reduce assembly time and simplify installation, the plastic compression sleeve is incorporated into the connector body. True 360° compression onto cable ensures superior RF shielding performance. Installation requires one-step 1/4" - 1/4" cable preparation. Incorporates an iridescent chromate finish plus UV resistant plastic to provide a reliable, environmentally sealed product.